Leeds have sacked their manager Thomas Christiansen after only eight months in charge at Elland Road. The Yorkshire club are 10th in the Championship having failed to win since Boxing Day and lost 4-1 at home to Cardiff on Saturday. Christiansen, 44, who formerly managed Cypriot side APOEL, also saw his team beaten in the FA Cup third round by League Two Newport County. Leeds are now looking for their ninth manager since 2014. Saturday's defeat at the hands of former manager Neil Warnock's Cardiff was a third in the last four Championship matches for the Whites. Dane Christiansen, a former Barcelona and Spain striker, replaced Garry Monk last summer and won five of his first seven league matches to take Leeds to the top of the table in September. Leeds issued a statement on Sunday which read: "Chairman Andrea Radrizzani and the board of directors would like to thank Thomas and his staff for their hard work over the past eight months." 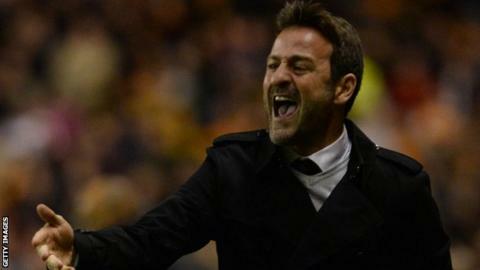 Leeds United are expected to make a swift appointment to succeed Thomas Christiansen. The suggestion is they may announce a new boss as early as Monday or Tuesday. Ex-England manager Steve McClaren was at the game at Elland Road on Saturday so is one name in the frame. Former boss Simon Grayson is another popular name and Reading's Jaap Stam, who was interviewed for the job prior to Thomas Christiansen's arrival, is also a possibility. I understand Christiansen's assistants, Julio Banuelos and Paul Butler, have also left Leeds, along with fitness coach Ivan Torres. Leeds are seven points off the top six and the club feels a move now could rescue a season in which the stated aim from owner Andrea Radrizzani was to make the play-offs.